Can you guess the phrase represented by the words below? Which path maps the circulation of the blood from the heart though the blood vessels and back to the heart? The thickest part of the myocardium is the . To avoid Varicose Veins you should avoid standing/sitting down for long period and exercise frequently. Symptoms of Peripheral Vascular Disease include pain with movement, tingling/burning/restlessness in foot when resting, fatigue, aching, pain/cramps at night. Symptoms of arrhythmia are fatigue, shortness of breath and chest pain. Hypertension is also known as high blood pressure. If Heart Disease is left untreated, it can result in heart attack or stroke. 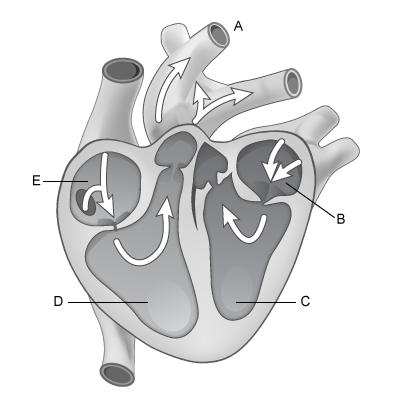 Identify features A - E labeled on the heart diagram below. The heart is the organ that pumps blood through your body. Which letters represent the chambers of the heart that pump blood to the body and lungs? Which letter represents the right ventricle? Which letter represents the left atrium? The heart rate that should not be exceeded during exercise. The heart rate that a person is working at sustaining so that they are doing the most work in the smallest amount of time. Bradycardia is a term describing an? What is the correct sequence for the path of blood through the body? 220 - age = ??? On the diagram below, five major anatomical parts of the heart are identified by the letters A - E. Fill in the blanks below with the letter or letters that correctly identify the part of the heart described by each statement. The heart is a muscular organ that pumps blood throughout your body.